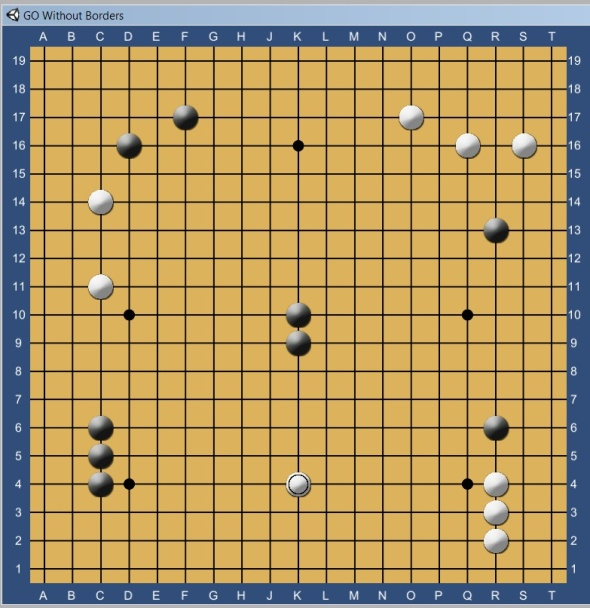 GO Without Borders is an experimental variant of the traditional game of Go, still in the development stage. We are actively recruiting a small circle of beta testers to help us debug and fully feature the program before public launch. We encourage you to share this invitation with your friends and fellow Go players. You will be asked to provide an email address. The purpose of collecting your address is so we can notify you when a new release is pushed as old releases may be incompatible with the server. You address will be added to the go-without-borders@googlegroups.com mailing list. This is a low-volume list where beta testers can report bugs and suggest new features. It's easy to unsubscribe if you don't want to be included. Note that out-of-date versions will not be able to log on to the server. Because this is beta software your Mac or PC may issue a warning and block installation unless you explicitly authorize the system to launch the program. If you have an aggressive firewall you may also have to give permission for the program to pass traffic to the internet the first time you play online. The basic idea behind GO Without Borders is not new. 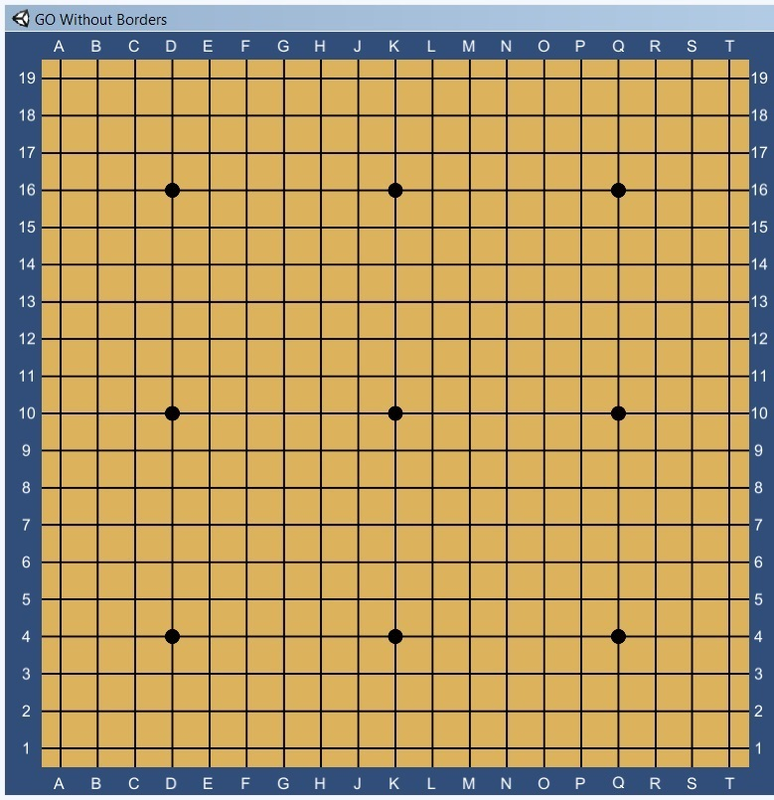 Imagine a Go board comprising a 19x19 grid in which the points along the leftmost border of the grid are connected to the points along the rightmost border of the grid and the points along the top of the grid are connected to the points along the bottom of the grid. That is, every one of the 361 points on the grid is identical in that they each have exactly 4 neighbors. The grid has no borders whose points have only three neighbors and no corners whose points have only two neighbors. Such a physical grid can be drawn on the surface of a torus. 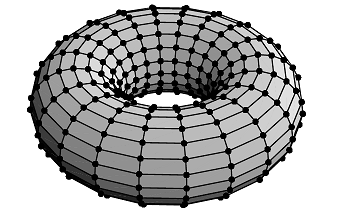 You can imagine creating such a torus by taking a 19x19 planar grid, connecting the top and bottom thereby forming an open-ended tube, then curving the tube back onto itself to connect the right and left sides. Playing Go on the surface of a three dimensional torus would be prohibitively confusing as players need to see every stone on the board simultaneously in order to aid whole board thinking so they can properly consider their moves. Earlier efforts to play toroidal Go on a two dimensional 19x19 board and via a correspondence game site called Little Golem replicated the lines in the border regions as well as the stones placed there to aid in visualizing the wraparound. (See Sensie's Library and Malcolm Schonfield's blog.) Our application resolves the topology into a simple planar two dimensional view through image replication and scrolling, giving the game a more natural and less confusing feel. Tactically, it's just Go. Strategically, we're not sure what it is yet. GO Without Borders is played with all the same rules as conventional Go. The difference is that 3,000 years of josekis, the strategy for forming moyos, and collective wisdom about playing fusekis are rendered irrelevant. Our experiences so far indicate that the game is dominated by fighting, though we expect territorial strategies and clever new fusekis to emerge as more highly skilled players become familiar with the game. When you launch the program for the first time, try it out in “Play Local” mode in which two players on the same PC take turns placing stones. The board looks like a conventional Go board, as in Figure 1, the only subtle difference being that lines extend off the top, bottom, and sides of the board, indicating wrap-around connectivity, rather than terminating at the rows marked 1 through 19, and columns marked A through T, which normally form borders. The line extensions logically connect those prior border points to their counterparts on the opposite border, that is, A-5 connects to T-5 and H-1 connects to H-19. If you point the cursor at any spot on the board then left-click and drag the mouse with the button held down, the view will change as the grid along with the row numbers and column letters scroll to keep a fixed registration with the lines they demark. As you scroll it appears as if you are gliding across an infinite plane of repeated grids, but you are not. You are viewing a snapshot of 361 unique points on the board, each one connected to exactly four neighbors. At all times every point and every stone is visible and each is displayed only once. To demonstrate the consequences of such a topology, place a black stone on the D-16 point by clicking that spot. (To avoid misclicks, which seem to occur a lot as users scroll, you can select the “confirm moves” option when you launch the game so that it takes two clicks in the same spot to place a stone. )The board would initially look like Figure 2. Smoothly scroll the board up and to the left. 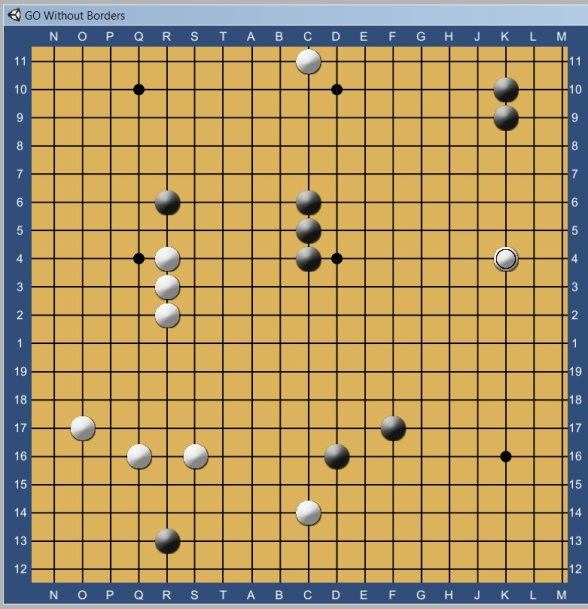 The black stone seems to disappear when it hits the top let corner, then simultaneously reappear at the bottom right corner as the board continues scrolling, leaving the board looking like Figure 3. Note that the piece did not change position on the 19x19 reference grid; it is always at D-16. Only your view of the board has changed. To more thoroughly demonstrate the nature of the board, place a series of black and white stones in any configuration then scroll around. The illusion will be created that these stones have been reproduced many times as you fly over an infinite plane of identical boards. But this is just an illusion. Each stone appears exactly once at any one time, and always at a fixed position with respect to the reference grid (K-5 stays K-5). Figures 4 and 5 show exactly the same board viewed from two different perspectives after scrolling. 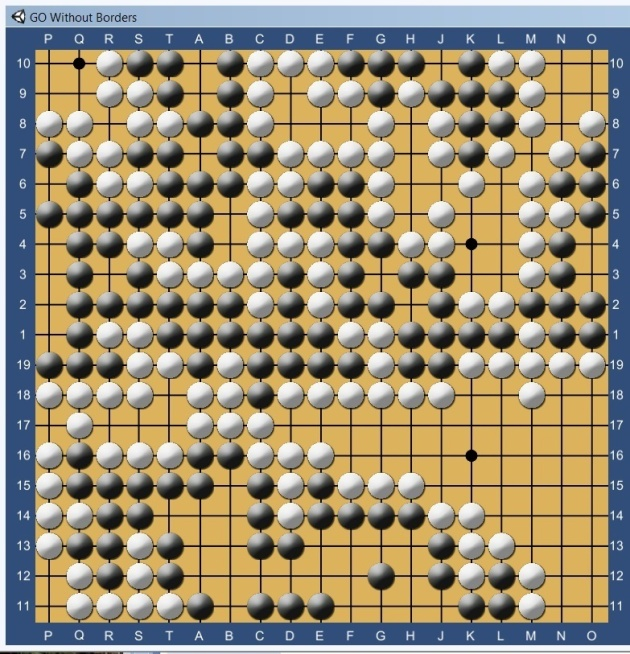 As you know, the game of Go very much depends on the relative positions of the stones – which stones are above and below each other, which stones are to the left and right of each other, and which stones are directly adjacent on connected points forming a contiguous group. 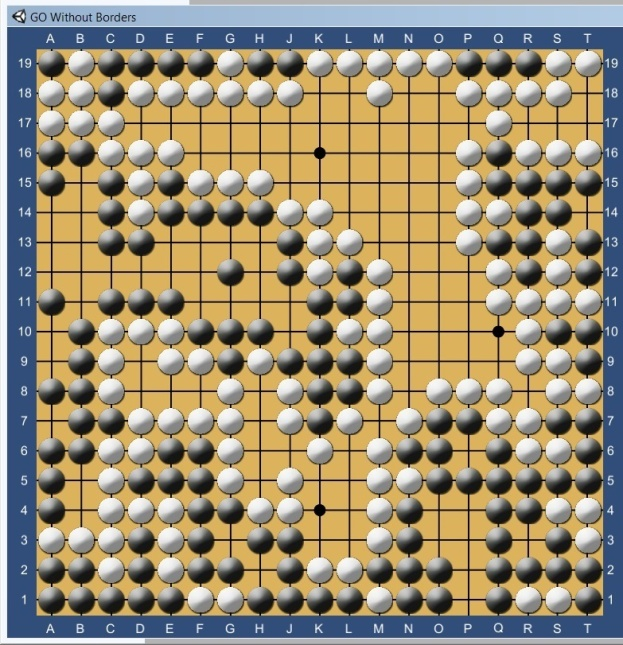 But the relation of the stones on a GO Without Borders board is not constrained by the edges of the board because there are no borders, the grid is a wrap-around continuum. 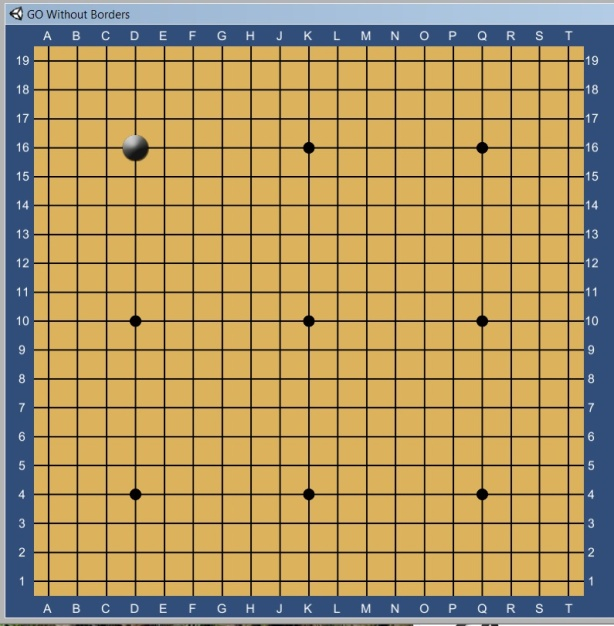 A stone at A-3 is directly connects to a stone at T-3, which becomes visually apparent when you scroll the board away from its initial position in which A and T would normally be far apart on opposite borders of the board. This has tremendous consequences to the way the game is played. 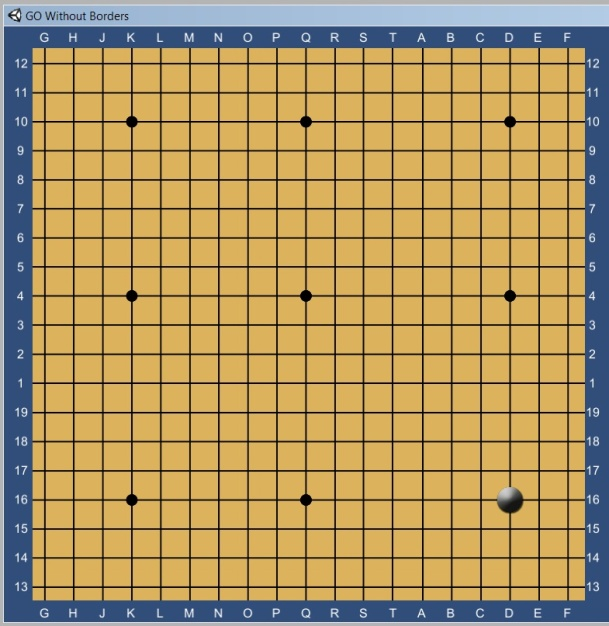 At the end of a game after you pass and each player marks the other player's dead stones, pause to understand the automatic scoring as the territory determination takes into account the fact that on a GO Without Borders board, contiguous territories simultaneously wrap around in both the horizontal and vertical dimensions. By way of example, Figures 6 and 7 show the same board at the end of a game, viewed from two different scrolled perspectives. Note that white's large enclosed territory in the upper center surrounding the K-6 point in Figure 6 appears in the lower right corner in Figure 7, spilling five points into the upper left corner. We set up an experimental server so remote players can meet up and be matched to play online. To do that click the “Play Online” button. The program will ask you to choose a screen name, which must be at least four characters long. Then hit “Log In.” Passwords and persistent accounts with player rankings and logging of the games for review are not set up yet. If you try to log on with an old version of the software it will ask you to first download the latest version. After you log in you will see a list of players on the left who have also logged in and are looking for a game. Click on one of the other names to issue a challenge. The player you challenged will get a message asking if they accept. If they do, your boards will be linked and you can play against each other. At this point, the player who issues the challenge is white and the player who accepts the challenge is black. You can place handicap stones wherever you'd like by having the white player pass the first few times. Fill in the preferred komi and check the box if you want to award the komi to white, otherwise it goes to black. At this stage of development it is probably best that the players communicate by voice so they can discuss the game with each other. Although a text messaging capability is built in it is still a little weird to understand what is going on. I am semi-retired, work mostly out of my home, and have a very flexible schedule so I am happy to play an online game with you if our schedules allow. If you'd like to play just drop an email to Bill Frezza at frezza@alum.mit.edu and we can pick a convenient time, even on the spur of the moment. I warn you, though, that I am only a 10 kyu player so if you are a dan level player I am going to ask for a big handicap to keep the game interesting. In order to collect your feedback and notify you when new builds are pushed we have set up a Google Group listserv. If you want to sign up as a beta tester please send an email to go-without-borders+subscribe@googlegroups.com to join. This GO Without Borders implementation was conceptualized by Bill Frezza and developed by John Gaby. We are grateful for the assistance being provided by our Go teacher and 8-dan player Cornel Burzo. Copyright ? 2018 John H. Gaby, All rights reserved.